Why should landscape be everyone's concern? Individuals have very different ways of regarding one and the same picture. While some will consider unspoilt nature as the greatest value, others may see the same area through commercial, historical or sentimental lenses. These different views are reflected in different opinions on how this land should be managed. Although the final decisions about the destination of certain plots are made by the local government (with the approval of relevant administrations), by law also local citizens and basically everyone who has an interest in the given area (so called stakeholders) have a right to influence these decisions. Participation: a multi-channel relationship based on a partnership of citizen and government, in which citizens actively engage in policy-making. 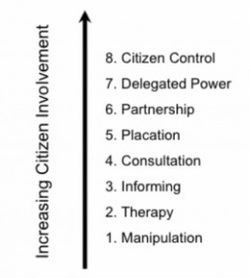 Active participation recognises the capacity of citizens to discuss and generate policy options independently – although the responsibility for the final decision rests with the government (2001 OECD Handbook on public participation). The Aarhus Convention grants rights to the general public regarding information and participation in decision-making processes on matters concerning the local, national and transboundary environment. Consulting the individual citizen increases the interest, involvement and attachment to the project. The citizen gains ownership of the project and will be proud to see the project succeed. This increases the awareness and appreciation of the surrounding landscape.